Review Summary: "Day & Age" is pretty much the most brilliant, retarded piece of music released this year. Do you like pop albums that are multi-layered for no other reason than to be ridiculous? Then you'll love this. Does anyone really take the Killers seriously" I mean, if Hot Fuss wasn’t enough to convince you, “When You Were Young” off of Sam’s Town should have made everyone and their mother realize Brand Flowers and company are in the business of making ridiculous pop music, seemingly done as though they are writing the greatest song of all time over and over but with that slight wink and nod to denote that they’re in on the joke as well. Previously, maybe the message had gotten muddled, as their debut was a little too glammy and their follow up a little bit too serious. 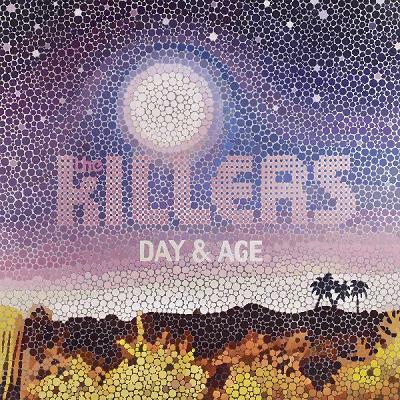 Day & Age however makes no pretensions of being anything other than what the Killers have always done best; ridiculously silly, stupid/genius pop. And you know what, it works wonderfully. My only real gripe with the album is that they perhaps put out the least impressive song as the single. “Human” showcases the Killers at their most normal, sounding just like anything from their previous two albums. While the lyric “Are we human, or are we dancer” has caused some slight confusion (despite being a neat allusion), the song is generally just a normal Killers song, sounding a bit too much like “When You Were Young” at points. The rest of the album is far more pushed to the extreme of Flowers weird songwriting, with the random horn section, flamenco flourish, organ, random dance rhythm, you name it and Flowers probably wrote something similar for Day & Age. While “Human” is predictable and standard, the rest of the album is anything but. From the opening track “Losing Touch“, we get a dirty groove that flitters in between the incredibly saccharine introduction and chorus. Imagine a marriage between Christmas-time bells and whistles and late 80’s sleeze rock, all with reckless abandon for showmanship. “Spaceman” and “Joy Ride” are similarly flamboyant songs filled with non-sequitors, as “Joy Ride” has horns and a LA-styled rhythm for no other reason than it sounds awesome when combined. It sounds like these songs were either written in 5 minutes or crafted for months upon months, with so much going on that the line between pop music and a deeper, more thoughtful art-rock attitude gets blurred (note: art-rock is used in the least art-rock way possible). Within all the glitz and glamour the album has (and boy does it pile it on [well, might I add]), there is also a decidedly human aspect to it. Singer Brandon Flowers, for all of his blowhardiness and pompous singing nature, still has those cracks and frailties in his voice the make him easy to relate to. While his lyrics still somewhat suffer from his inability to decide whether he wants to write accessible pop lyrics or more insightful material, his singing has never been overall more entertaining and easy to listen to. “I Can’t Stay” has him crooning over an island styled tune, replete with harp and xylophones. “A Dustland Fairytale” starts off normally enough, a soft piano and synth over Flowers singing “He’d look just like you’d want him too; some kind of slick chrome American prince”, but follows the Killers realms of expanding songs into the ridiculous as it turns into a bombastic arena-rock anthem, Flowers bellowing away. I don't wanna be broke, I don't wanna be saved, I don't wanna be S.O.L. It’s a point for a glitzy record to turn into something more relatable. While follow up “The World That We Live In” continues to have an upbeat glossy feel, it seems more down to earth and touching than anything else before it. “Goodnight, Travel Well” is the epoch of the Killers career thus far, being darker, more brooding, and a lot more real than anything else they’ve ever written. The song details the feelings about losing a loved one, and it slowly builds up from the numb feelings one experiences at first (“The unknown distance to the great beyond stares back at my grieving frame) to the rambling nature of trying to accept death (“Every time you fall and every time you try, every foolish dream, and every compromise…etc) in a slow but paced fashion. As it reaches its intense climax of pained realization (“stay, don’t leave me, the stars can’t wait for your sign, don’t signal now”), one can’t help but appreciate how down to earth the Killers bring the album. It is with a closing extended spasm of “Goodnight, travel well” that the Killers decide to end Day & Age, and it is essentially the message of the album. A grandiloquent trip, Day & Age is best listened to with no expectations, on a night where you have little else to do but just listen to the new Killers record. It is a hodgepodge of stupid ideas that one will either find brilliant or, well, stupid. However, it is hard to deny that it is a pop album of massive ambition and yet, suffers from none of the pretentiousness that plagues most of the Killers contemporaries in that aspect. Yeah, it’s highly derivative and entirely full of itself, but when it’s so ridiculously fun (and at the right moments, authentic), its easy to look past such trivial matters and just love the music for being so damn cool. okay I have given this my first listen and its a 3-4. I kinda don't see how considering it not to be serious makes it more than bad music. You "kind of don't see"? What does that mean? I'm listening through it for my first time. Joy Ride reminds me a lot of Young Americans, which is my favorite Bowie song, so it's nice to have another song with that sound. It can't compare to it but I still like it. So far it's looking to be 3.5-4 range for me. why do you only write reviews when you're drunk now? Ooooh John, I'm unsure about this review. I can definitely see where you are coming from, but you don't convince me at all. Does 'Human' really sound like 'When You Were Young'? Hmmm, not sure about that. And your final concluding sentence is so general that it could almost be applied to many terrible albums. Hell, you could ALMOST tack it on to the end of my Hinder review!!! Ok, that may be taking it too far, but think of that last sentence at the end of say a Wolfmother, Get Born or Infinity On High review. It would look almost as natural, yet wouldn't befit the album rating! Of course, I am still to hear this album so you could be totally right when all is said & done. Albums merged. Great job, Hanson. this review pretty much says everything I dislike about the album is good. I love the first song. yeah adam after reading your review I think you are thinking way too much like a high brow music critic when listening to this, as opposed to just listening to it as a music fan. So because I didn't like the album, I'm listening to it improperly? More than likely, you didn't like it because it's The Killers, who are lumped in with crappy bands because they are in the mainstream. High brow music critics can't listen to The Killers, they are mainstream trash, duh. Now look what you've done Chan... John just called me "Atavan". I was gonna review, this but I agree on absolutely everything that you said here, so theres really no point. I think that this is a love/hate album. You either love it for its ridiculousness, or you hate it for exactly the same reason. I personally love it. That may be, but I still don't like going into a record with the prerequisite of understanding that it's stupid. Like if I acknowledge that that flaw is a good thing, then it's awesome. "Or its the mark of having an opinion that doesn't align with yours. And I said one song sounded like Talking Heads, that's not over comparing them to 70s/80s acts"
You keep getting so defensive and instead of debating with me you are just saying "my opinion is different blah". I don't think you ever gave this album a real chance tbh. You're criticizing my review mostly because my opinion is different from yours. I said "Human" is the best song and then when my reasons for why didn't satisfy you, you decided I didn't give the album a "real chance." I think I'm debating with you but come up with some points other than "you don't get this album so you're wrong."